One swears by tradition, the other welcomes technology. But both whip up rare-to-find silken mounds of Iranian heritage. Some time after sunrise, the call of a bearded vendor in kurtalungi echoes through the treelined alleys of Dadar Parsi Colony. “Paneerwalo,” he hollers, careful not to tip the aluminium handi balancing on his head. Like children drawn to the chime of an icecream cart, residents trickle out to pick up topli ma paneer – little melt-in-the-mouth roundels of cottage cheese spiked with salt to tease the palate. For Peddar Road resident Aban Pardiwalla, this is a childhood memory. But Dinaz Wadia, 66, a resident of Parsi colony, where she lives with husband Hosi, sees the scene play out in the street below even today. 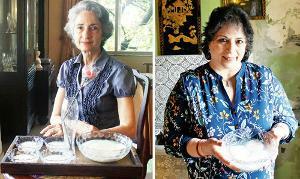 Both, interestingly, accept orders to hand-make the delicacy that’s no longer made in every Parsi home, or available at stores. With a texture akin to that of the Italian panna cotta, topli ma paneer (paneer-in-a-basket) is an integral part of the feast served at Parsi weddings. Aban, who began home-catering to distract herself after her mother’s death, starts her morning with warming whole fat milk to just the right temperature before a 100 per cent vegetarian enzyme is introduced to curdle it. Once at perfect consistency, the milk is poured into teacups and after it’s allowed to set for a few hours, the jiggly roundels are scooped out, turned into individual wicker baskets (stainless steel strainers in Dinaz’s case) and left to drain for another couple of hours. Imprinted with the characteristic basket-weave pattern by the time they’re ready to eat, the delicate milk patties are then preserved in a bowl of fresh, briny whey. “They are best consumed right away, of course,” says Dinaz. Dessert makers these days use topli ma paneer as base for their cheesecakes, in which case, says Aban, they should be a day old, and firmer. The two deviate from the traditional recipe which employed non-vegetarian rennet (produced in any mammalian stomach) and whose origin, chef and Parsi cookbook writer Niloufer Ichaporia King traces back to the cuisine of Bakhtiari tribesmen. The Persian pastoralists who, traditionally, lived a nomadic existence, shuttled between Esfahan and Shiraz (central to south Iran). Topli ma paneer, in a previous avatar, was Khiki cheese (‘khiki’ being the Bakhtiari word for ‘skin’; a reference to the non-veg enzyme that was a key ingredient). When salted, khiki became paneer-e-shour. “It doesn’t seem out of the question, therefore, to speculate that our fleeing forebears may have brought the technique for both kinds of paneer with them to India,” writes King. Neither Dinaz nor Aban are sure about the origins of the recipe (Dinaz arrived at hers after several alterations to a friend’s recipe; Aban’s is her mum’s old recipe) but it’s one they’ve perfected over the years. The proof is in the number of orders they receive every week.